Description: Pilotwings Resort puts the player in the pilot's seat as never before in this long-awaited three-dimensional update to the Pilotwings series! Import your Mii characters from the Nintendo 3DS Mii Maker and explore Wuhu Island (the star of Wii Sports Resort and Wii Fit Plus) by plane, by hang glider and by rocket belt. Each vehicle type features unique controls that offer a different challenge. Complete around 40 challenging flight missions in Mission Mode to earn stars, or scour Wuhu Island for hundreds of collectible Extras in Free Flight Mode as you unlock interactive 3D Dioramas of various aircraft and famous island monuments. Get a bird's-eye view of familiar Wuhu Island sites and a few new ones! You can even share your experiences with friends and family members by taking in-game photos and saving them to the Nintendo 3DS photo album. Pilotwings Resort is an aerial sports game gem that offers amazing 3D views of Wuhu Island. - Soar through the skies over the tropical Wuhu Island in a hang glider, rocket belt or plane each with its own unique controls, distinct feel of flight and new game play. - Hours of high-flying fun. Mission Mode and Free Flight Mode offer a wealth of activities, challenges and game play for gamers of all tastes. Leisurely soar around Wuhu Island and explore and catalogue points of interest, or fly competitively in missions that are based on time and points. - Take control of an amazing 3D flying experience with your Mii characters. Pilotwings Resort pulls your personal Mii character from the Mii Maker application, and features the Mii as the star of this adventure. Pilotwings Resort features a breadth and depth of field that can only be achieved with the 3D effects of Nintendo 3DS, offering a feel and style of play never before seen in an aerial sports game. - You can snap photos of postcard-perfect locales on Wuhu Island with the hang glider in Free Flight Mode and as part of select challenges in Mission Flight Mode. - Photos of your aerial adventures on Wuhu Island may be saved to the Nintendo 3DS photo album and shared with your friends and family. Box Text: Take Flight to a New Dimension! - Fly your Mii character through a three-dimensional world in three different aircraft, each with distinct controls and precise maneuvering. - Complete more than 40 challenging flight missions in Mission Mode to earn stars. - Explore Wuhu Island in Free Flight to find hundreds of collectible extras, and take pictures for your Nintendo 3DS photo album! 04-05-2014 poilkjmnb Description Pilotwings Resort puts the player in the pilot's seat as never before in this long-awaited three-dimensional update to the Pilotwings series! Import your Mii characters from the Nintendo 3DS Mii Maker and explore Wuhu Island (the star of Wii Sports Resort and Wii Fit Plus) by plane, by hang glider and by rocket belt. Each vehicle type features unique controls that offer a different challenge. Complete around 40 challenging flight missions in Mission Mode to earn stars, or scour Wuhu Island for hundreds of collectible Extras in Free Flight Mode as you unlock interactive 3D Dioramas of various aircraft and famous island monuments. Get a bird's-eye view of familiar Wuhu Island sites and a few new ones! You can even share your experiences with friends and family members by taking in-game photos and saving them to the Nintendo 3DS photo album. Pilotwings Resort is an aerial sports game gem that offers amazing 3D views of Wuhu Island. FEATURES: - Soar through the skies in this classic Nintendo franchise - Soar through the skies over the tropical Wuhu Island in a hang glider, rocket belt or plane each with its own unique controls, distinct feel of flight and new game play. - Hours of high-flying fun. Mission Mode and Free Flight Mode offer a wealth of activities, challenges and game play for gamers of all tastes. Leisurely soar around Wuhu Island and explore and catalogue points of interest, or fly competitively in missions that are based on time and points. - Take control of an amazing 3D flying experience with your Mii characters. Pilotwings Resort pulls your personal Mii character from the Mii Maker application, and features the Mii as the star of this adventure. 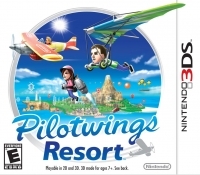 Pilotwings Resort features a breadth and depth of field that can only be achieved with the 3D effects of Nintendo 3DS, offering a feel and style of play never before seen in an aerial sports game. - Share the fun with family and friends - You can snap photos of postcard-perfect locales on Wuhu Island with the hang glider in Free Flight Mode and as part of select challenges in Mission Flight Mode. - Photos of your aerial adventures on Wuhu Island may be saved to the Nintendo 3DS photo album and shared with your friends and family. 04-05-2014 poilkjmnb Box Text Take Flight to a New Dimension! - Fly your Mii character through a three-dimensional world in three different aircraft, each with distinct controls and precise maneuvering. - Complete more than 40 challenging flight missions in Mission Mode to earn stars. - Explore Wuhu Island in Free Flight to find hundreds of collectible extras, and take pictures for your Nintendo 3DS photo album! 04-05-2014 poilkjmnb Description Pilotwings Resort puts the player in the pilot's seat as never before in this long-awaited three-dimensional update to the Pilotwingsâ„¢ series! Import your Mii characters from the Nintendo 3DS Mii Makerâ„¢ and explore Wuhu Island (the star of Wii Sports Resort and Wii Fit Plus) by plane, by hang glider and by rocket belt. Each vehicle type features unique controls that offer a different challenge. Complete around 40 challenging flight missions in Mission Mode to earn stars, or scour Wuhu Island for hundreds of collectible Extras in Free Flight Mode as you unlock interactive 3D Dioramas of various aircraft and famous island monuments. Get a birdâ€™s-eye view of familiar Wuhu Island sites â€“ and a few new ones! You can even share your experiences with friends and family members by taking in-game photos and saving them to the Nintendo 3DS photo album. Pilotwings Resort is an aerial sports game gem that offers amazing 3D views of Wuhu Island. 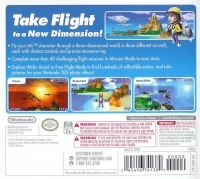 FEATURES: â€¢ Soar through the skies in this classic Nintendo franchise â—‹ Soar through the skies over the tropical Wuhu Island in a hang glider, rocket belt or plane each with its own unique controls, distinct feel of flight and new game play. â€¢ Hours of high-flying fun â—‹ Mission Mode and Free Flight Mode offer a wealth of activities, challenges and game play for gamers of all tastes. Leisurely soar around Wuhu Island and explore and catalogue points of interest, or fly competitively in missions that are based on time and points. â€¢ Take control of an amazing 3D flying experience with your Mii characters â—‹ Pilotwings Resort pulls your personal Mii character from the Mii Maker application, and features the Mii as the star of this adventure. â—‹ Pilotwings Resort features a breadth and depth of field that can only be achieved with the 3D effects of Nintendo 3DS, offering a feel and style of play never before seen in an aerial sports game. â€¢ Share the fun with family and friends â—‹ You can snap photos of postcard-perfect locales on Wuhu Island with the hang glider in Free Flight Mode and as part of select challenges in Mission Flight Mode. â—‹ Photos of your aerial adventures on Wuhu Island may be saved to the Nintendo 3DS photo album and shared with your friends and family. 04-05-2014 poilkjmnb Box Text Take Flight to a New Dimension! â€¢ Fly your Miiâ„¢ character through a three-dimensional world in three different aircraft, each with distinct controls and precise maneuvering. â€¢Complete more than 40 challenging flight missions in Mission Mode to earn stars. â€¢Explore Wuhu Island in Free Flight to find hundreds of collectible extras, and take pictures for your Nintendo 3DS photo album! 04-28-2013 psiencewins Box Text Take Flight to a New Dimension! â€¢ Fly your Miiâ„¢ character through a three-dimensional world in three different aircraft, each with distinct controls and precise maneuvering. â€¢Complete more than 40 challenging flight missions in Mission Mode to earn stars. â€¢Explore Wuhu Island in Free Flight to find hundreds of collectible extras, and take pictures for your Nintendo 3DS photo album! 04-28-2013 psiencewins Description Pilotwings Resort puts the player in the pilotâ€™s seat as never before in this long-awaited three-dimensional update to the Pilotwingsâ„¢ series! Import your Mii characters from the Nintendo 3DS Mii Makerâ„¢ and explore Wuhu Island (the star of Wii Sports Resort and Wii Fit Plus) by plane, by hang glider and by rocket belt. Each vehicle type features unique controls that offer a different challenge. Complete around 40 challenging flight missions in Mission Mode to earn stars, or scour Wuhu Island for hundreds of collectible Extras in Free Flight Mode as you unlock interactive 3D Dioramas of various aircraft and famous island monuments. Get a birdâ€™s-eye view of familiar Wuhu Island sites â€“ and a few new ones! You can even share your experiences with friends and family members by taking in-game photos and saving them to the Nintendo 3DS photo album. Pilotwings Resort is an aerial sports game gem that offers amazing 3D views of Wuhu Island. FEATURES: â€¢ Soar through the skies in this classic Nintendo franchise â—‹ Soar through the skies over the tropical Wuhu Island in a hang glider, rocket belt or plane each with its own unique controls, distinct feel of flight and new game play. â€¢ Hours of high-flying fun â—‹ Mission Mode and Free Flight Mode offer a wealth of activities, challenges and game play for gamers of all tastes. Leisurely soar around Wuhu Island and explore and catalogue points of interest, or fly competitively in missions that are based on time and points. â€¢ Take control of an amazing 3D flying experience with your Mii characters â—‹ Pilotwings Resort pulls your personal Mii character from the Mii Maker application, and features the Mii as the star of this adventure. â—‹ Pilotwings Resort features a breadth and depth of field that can only be achieved with the 3D effects of Nintendo 3DS, offering a feel and style of play never before seen in an aerial sports game. â€¢ Share the fun with family and friends â—‹ You can snap photos of postcard-perfect locales on Wuhu Island with the hang glider in Free Flight Mode and as part of select challenges in Mission Flight Mode. â—‹ Photos of your aerial adventures on Wuhu Island may be saved to the Nintendo 3DS photo album and shared with your friends and family. This is a list of VGCollect users who have Pilotwings Resort in their Collection. This is a list of VGCollect users who have Pilotwings Resort in their Sell List. This is a list of VGCollect users who have Pilotwings Resort in their Wish List.